If you are looking for new sources of inspiration, I’d like to introduce you to some distinctive artists, designers, and illustrators – both past and present – that I think ‘you should know.’ Some may be lesser-known while others may seem vaguely familiar, either way you will discover unique talents that might just influence your next design project. This year marks the 80th anniversary of the 1939 cinematic adaptation of The Wizard of Oz. There is hardly a person who has missed seeing the motion picture on television or on the big screen over the years, and despite its age, the film continues to grow in popularity with audiences young and old. Fewer people today are as familiar with the movie’s original source material, the groundbreaking children’s book The Wonderful Wizard of Oz. The book has had countless sequels, assorted re-imaginings and many reissues, complete with new packaging and illustrations, since first being published in 1900. 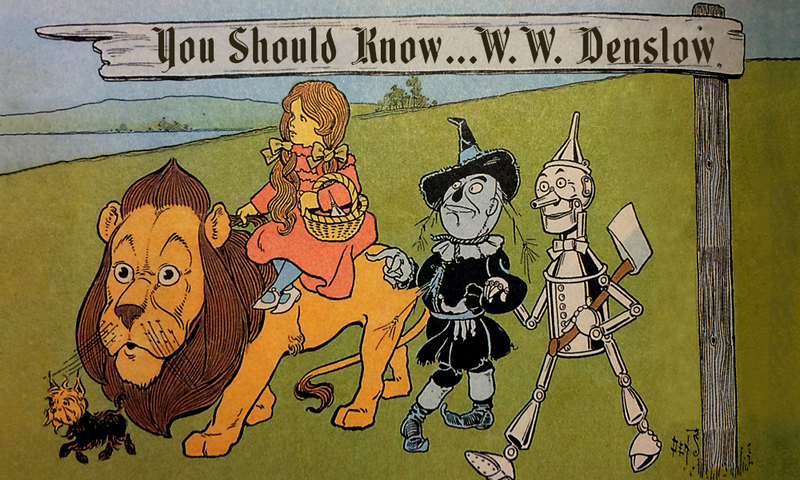 But, it is the original story by L. Frank Baum and the innovative illustrations by W. W. Denslow that first captivated audiences and turned the book into an instant classic. Furthermore, it is the unique work of Denslow that served as the visual framework for the film and as an inspiration to subsequent generations of illustrators and designers. After their split, Denslow used his fame to launch a solo career. Between 1901 and 1904 he created new illustrations for popular works, retelling them with his own unique visual style. His works included Denslow’s Mother Goose published in 1901, Denslow’s Night Before Christmas published in 1902, and an 18-volume series called Denslow’s Picture Books published between 1903 and 1904. Regardless of his tragic end, Denslow made a lasting mark on his profession. He also played a pivotal role in the creation of a new literary genre – the American Fairy Tale. Without Denslow’s contributions, Baum’s groundbreaking book and the subsequent pieces it inspired might have a completely different visual language. Denslow, W.W. Assorted Images of Denslow’s Illustrations. The Library of Congress (www.loc.gov) and Project Gutenberg (www.gutenberg.org). Web. 5 May 2014.